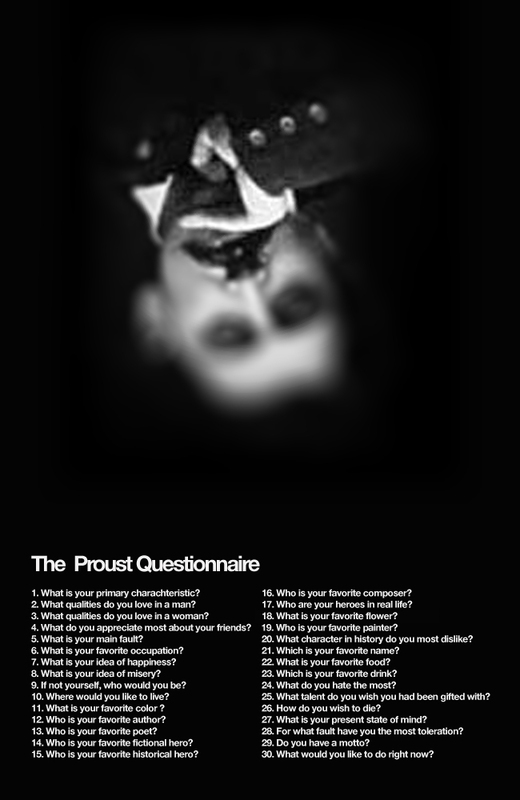 At the end of the nineteenth century, when Marcel Proust was still in his teens, he answered a questionnaire in an English-language Confession album belonging to his friend Antoinette, daughter of future President Felix Faure. Recently I read Yyves Saint Laurent’s answers to these questions on the wall of a museum and wrote them down into my notebook for future use. So far it’s made intimate meetings in a whisper, groups out eating with laughter, and casual conversations much more interesting and a little more fun. 1. What is your primary characteristic? 2. What qualities do you love in a man? 3. What qualities do you love in a woman? 4. What do you appreciate most about your friends? 5. What is your main fault? 6. What is your favorite occupation? 8. What is your idea of misery? 9. If not yourself, then who would you be? honestly, there was a time in my life when I would have been so grateful to have been absolutely anyone but me. today i believe myself to have come full circle, and wouldn’t choose to be anyone but me. 10. Where would you like to live? by the sea… the sea! 11. What is your favorite color? 12. Who is your favorite author? 13. Who is your favorite poet? Different answers for different occasions. I would say Rilke for his bravery and honesty, Rumi for his devotion and all the fires he’s lit since time began to write things down, but day to day my answer is Frank O’Hara without even flinching. 14. Who is your favorite fictional hero? 15. Who is your favorite historical hero? Karl Marx. Like Gandhi, Thomas Jefferson, and Dr. Martin Luther King Jr., Marx had the audacity to believe that everyone, everyone, deserves something do do, somewhere to live, and something to eat. And while the dreamer himself, after many years of critical revision and mathematic assessment, walked away from the Paris commune — the only example to date of a Marxist experiment — with his hands in the air proclaiming it a failure, Marx’s ideas broke down barricades, and built new ones against them. A provocateur who, because he was right, continues to stir deep fear in the hearts of capitalists, and light bright fires in the hearts of idealists, socialists, and humanists everywhere. 16. Who is your favorite composer? 17. Who are your heroes in real life? The beautiful men and women I work with in recovery — my sponsees. 18. What is your favorite flower? I have timeless loves, and I have superficial acquaintances with flowers. At the moment my heart sings for quince blossoms. 19. Who is your favorite painter? 20. What character in history do you most dislike? while I would go so far as to say that I hate the likes of Tomas de Torquemada, Pol Pot, Hitler and Gilles de Rais, I am blessed to live in a world where these creatures are rarely given any thought or energy whatsoever. 21. Which is your favorite name? I love classic names. Simple, and pure from the english language like Mary, Rachel, Karen and Audrey for women. For men I love more antique names like Silas, Theo, Jaffrey, and Walter. But I couldn’t pick a favorite. I love the absurd combination of names, faces, and personalities. It’s endless and so beautiful that it would be criminal to stop anywhere along the way. 22. What is your favorite food? i love chocolate, bread and cheese… butter, cream, coffee, and apples which are still ever so slightly green inside. 23. Which is your favorite drink? 24. What do you hate the most? 25. What talent do you wish you had been gifted with? 26. How do you wish to die? 27. What is your present state of mind? Currently I am growing. I have been burst apart, literally flung wide open, and my lust for life has reawakened. I am curious, inspired, moody, reflective, loving, liberated, generous, and free. 28. For what fault have you the most toleration? 29. Do you have a motto? my family actually have a motto, but i don’t live by it. mine is ever changing. at the moment it’s ‘i love you, i love you, like the stars above you’ but it could be something else later tonight. 30. What would you like to do right now? bite someone’s neck, kiss their lips, laugh with my son, dance until the sun comes up and then fling myself into the bay. I had no idea that you revered Thomas Jefferson too, like I! I love what you said about Marx.